University lifestyle can be an overwhelming experience, with so much to do and seemingly little time to do it all. In order to make the most of your time in college/university, you will need to do well in class, take advantage of extracurricular opportunities, and prepare yourself for life after graduation. Going to college can be a fun and exciting time, especially if you are committed to being successful. Go to class. Each missed class represents missed content and missed discussion. Some professors weigh participation into your final grade calculation. Even if attendance isn’t required, however, you will make a good impression on your professor and TA if you show up to class. Only miss class if you are genuinely sick—too sick to get anything worthwhile out of the lecture. If you need some incentive, consider the cost of each class hour. Take notes. Your memory is never as good as you think it is. There will probably be plenty of things taking up space in your mind while at school. Taking good notes will keep you engaged in classroom activities (lectures and discussion) and give you a good basis when studying for exams. Participate in class. Ask questions of your instructors, give answers if they ask questions, and contribute to discussion sections. Taking an active part in the class will keep you involved with the material, and help you better understand what the instructor needs you to know. Sitting in front, or at least not in the back, will make it easier to pay attention and put you front and center for the professor to see. Take time to study. Success in college relies on you preparing outside of class, so spend time reviewing your notes and reading the textbook for each session. When you study, find a quiet space and cut off outside distractions. 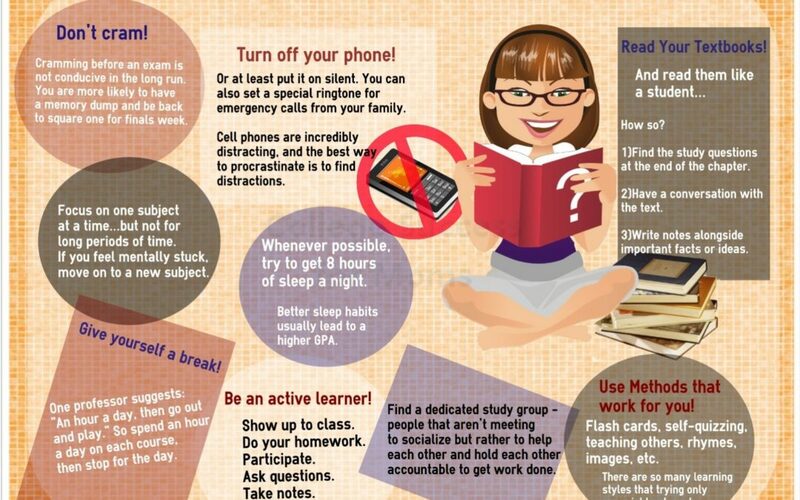 A good rule of thumb is to spend two hours studying for each hour you spend in class. Study groups—working with other students in your class—can be helpful, but also go off-track easily. Make sure you find a study group that reviews the material, and spends most of its time actually studying, rather than chatting. Don’t cram! Part of being a successful college student is doing more than passing tests; it’s retaining the useful information for the real world. When you cram, you might remember enough to pass your exam, but chances are high that you’ll forget most of it in a day or two. When you’re spending tens of thousands of dollars to learn this stuff, actually remembering it for later is a smart investment. Spacing out your study sessions over a few days is the best way to make sure you remember the material later. Rather than spending a 9-hour marathon studying for a test, for example, start a few days early and study for 1-2 hours each day for 3 or 4 days in a row. If you can plan well ahead of time, it’s even better to space your studying out over a period of weeks. Avoid procrastinating. No professor ever complained about her students finishing an assignment early. Setting aside time to complete one task will give ease your stress level, and make it more likely to complete others on time. On occasion, you may need to stay up all night to finish an assignment. Procrastinating will only make doing so more likely, and doing work early can help you get more regular sleep. Set yourself regular performance goals. These small goals seem easy to do so you’re less likely to procrastinate on them. However, the accomplishments will pile up fast. Communicate with your instructor. Your professors want you to do well in class, so feel free to ask questions about the material. Every professor has open office hours, so stop by to introduce yourself, ask about the class, or discuss your grades. This can allow them to learn more about you, your strengths and weaknesses, and provide better feedback for improving your work.